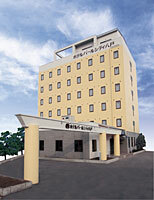 Hotel Pearl City Hachinohe is located at 5 minutes walk from JR Hon-hachinohe Station. It is conveniently located nearby the exit of Hachinohe Expressway as well as the ferry terminal. It is also just one hour from Misawa Airport. Furthermore, all-rooms are equipped with satellite digital television, LAN access, shower toilet and samue for the comfortable stay. 5 minutes walk from JR Hon-hachinohe Station.